The Library provides an excellent introduction to Romanian literature, from the classics to the most famous contemporary authors. Romanian cultural magazines are also available. You are warmly invited to read them in the cosy, welcoming space at the Institute or take advantage of our free borrowing system. 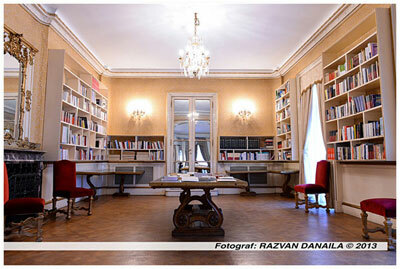 The Romanian Library houses over 2,300 volumes in Romanian and English of fiction and non-fiction, art albums, dictionaries, textbooks for learning the Romanian language, guidebooks and children's books. The books were kindly donated by the Romanian publishing houses which took part in the London Book Fair 2010, by the Romanian Cultural Institute in Bucharest and by the Embassy of Romania in London. The Library’s catalogue includes also the first eight books translated from Romanian by the University of Plymouth Press. 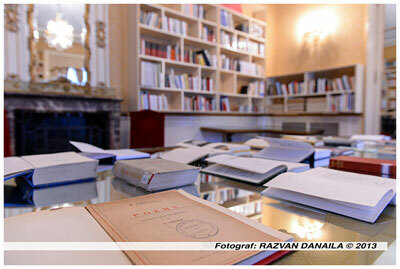 In January 2013, the Romanian Library has been enriched with more than 300 books published mostly by the Romanian Cultural Institute in the recent years. New works of fiction, biography, art history, history, etc. await you in the library’s cosy ambient, ready for you to browse, read or borrow. The expansion of our collection signals the start of a campaign to endow major British libraries with fundamental Romanian references, older or recent. Click here to check our catalogue (pdf file). 1. How do I join the library? You just fill-in a short application form (you can download it here). Anybody can join for free. 2. How do I find a title in the library? You can access the catalogue available in the library or on our website. 3. How many items can I borrow and for how long? You can borrow up to three items for a maximum period of one month. 4. Can I renew or reserve an item? Yes, please contact us at library@icr-london.co.uk. 5. What happens if the book get lost or deteriorated? You must replace it or reimburse it. The library is open Mon to Fri, from 10am to 5pm.